4th event in a series of 8. Whilst chilly, the predicted icy conditions (albeit for a small section of path) failed to materialise, so runners were able to get a clip on. 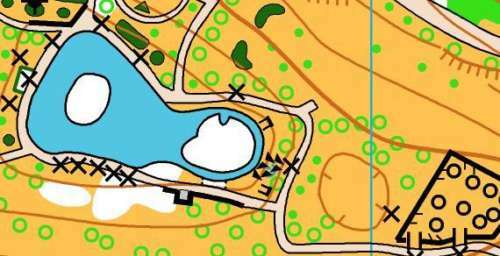 Indeed (and even though my running pals often mock orienteering as ‘not proper’ running) there were plenty up who finished with a sweat on - with a few remarking appreciatively that it had been good to be able to run a lot.... cont. In the end, the direction to ‘do what you want’ was interpreted wonderfully, and as I hoped: rather than clearing the park before going onto the streets, the better strategy was to go in and out of the park using the many access routes into the urban. Note Andrew Hobson’s exceptional achievement; I think he did this several times. My apologies for the street answers; I think they were all there – just in the wrong boxes. Anyway, my (and others’) preferred trust-based self-check (I teach ethics after all) seemed to work just fine. Reserved apologies to Jake Powell who, being under 16, I had to keep in the park: he cleared controls 1 – 20 in 27 minutes, but then, no doubt driven by genetics, happily went off to find many of the same from different directions. I won’t apologise if your name is spelled wrong: your handwriting needs improvement (that said, if you’d like to see any corrections, please let me know: names matter, as do scores for many). Thanks, as ever, to the control collectors; as every organiser knows, it makes a big difference. And to Chris for his guidance in the event’s preparation, including ideas about the urban element; those thinking about having a go at putting on an event for the first time should worry not with the support that’s available and willingly given. Assembly at the northwestern park gates on Bolton Road.